910. Mr. Joseph Abigail NAVERA was born on Dec 5 1966 in Naga City. He is also known as Joe. He was educated BS Computer Science in 1987 in De La Salle College, Taft Ave., Manila. He finished high school in Ateneo De Naga in 1983. His current work is at IBM Philippines as Project Manager under the Strategic Outsourcing Division. He manages Data Centers, Application Maitenance, networks, and Client Server installations. 1123 i. Maria Eliza NAVERA was born on Nov 8 1996 in Medical City Hospital, Mandaluyong. 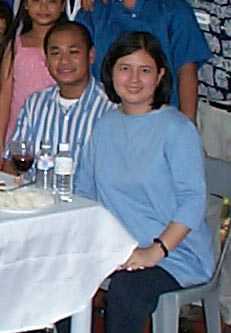 She was baptized on Dec 8 1996 in St.Andrew's Church, Reposo St., Makati City. Marty's godparents were Robert Navera and Margarita Roco. Present during the baptism were Lola Rosario Roco viuda de Roco, her greatgrandmother. Also present during the reception was Marty's Granduncle, Sen. Raul Roco. She is also known as Marti. At that time, Margarita, his godmother, just received her letter from Barcelona accepting her to the singing competitionin Barcelona, Spain. 1124 ii. Joseph Noel NAVERA was born on Dec 9 1997 in Medical City Hospital, Mandaluyong. He is also known as Picolo.